We will mail you a receipt for your gifts. 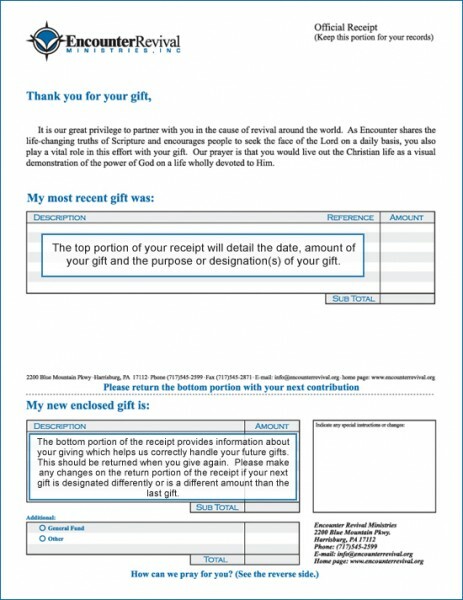 The receipt will meet all IRS requirements for substantiating your deduction for support and ministry gifts. Along with your receipt, we will enclose a letter from our Director Ardy Parlin, who will share with you what is on his heart, as well as thank you for your prayers and support in helping our ministry proclaim the truths of revival. We will also enclose other information from time to time to keep you informed about services, resources and giving opportunities.